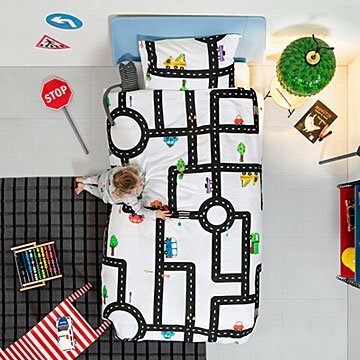 Drive into a dream with this road map bedding set. Full tank of gas? It’s also a play mat for toy cars. It'll be years before your little one gets a license, but they're already dreaming about hitting the open road. Amateur speed racers won't mind driving off to bedtime, thanks to this pillowcase and duvet cover. Printed with a fun road map and colorfully illustrated vehicles, it's a comfortable place to pull over for the night. Kiddo's still got a full tank of gas? It doubles as a fun playmat to cruise toy cars on by day. Designed by Peggy van Neer and Erik van Loo in the Netherlands. Made in Portugal.